The following comment was submitted by Tim on 21 March 2009 in response to our post “Colder’s Furniture ‘Fan’ Calls US Extortionists “. We reply immediately afterwards. I absolutely hate colders pricing methods. The main issue with the full back or buy back program is that the “retail” price or higher price on their tags is SOOOOO expensive, that it’s inconceivable that anyone would be stupid enough to buy an item at their “retail” price. The other price they have on the tag is “floor model” price which means that you must take the item off the floor. This to me is not consumer friendly. Also, with the economy the way it is, the floor model price is now the same price for a new item in the box. Colders is starting to realize how uncompetitive they really are. Their sticker pricing is so ridiculous, that any good consumer who does his or her homework should be able to spot these ridiculous prices and not be fooled. Please do your homework before you make an expensive purchase and you will not get burned. I honestly believe that the Colders in Grafton will not be open much longer. The store is never busy, and even the Sales Associates who are 100% commission have commented to me on how ridiculously over priced their “retail” price is. We believe Tim is spot-on about Colder’s pricing. We’ve had people defending their pricing, being OK with paying hundreds more for an item because they were getting “money back” toward “something more”. We admit we don’t quite get it. That “something more” has to then be purchased at Colder’s regular-retail price, which we’ve often seen to be high compared to competitors, so where exactly are the big savings? And even if you do manage to score a deal and save, say, a couple hundred bucks…if you end up having problems or need something after the sale–we’ve read enough reports of Colder’s showing absolutely no interest in fixing items or otherwise taking good care of honest customers–was it really worth it? It’s crazy to stand around all day earning nothing. Maybe that explains the behavior of the saleslady that’s stalked us through the Grafton store so many times, too. We definitely think there’s demand for a bigger-box-variety retail furniture store in that part of Ozaukee County. But Colder’s isn’t it, by our own estimation, and it’s increasingly clear it’s their own fault–brought about by terrible pricing, ridiculous promotions, unethical sales behaviors, general rudeness, poor customer service all the way up their corporate ladder to Colder’s corporate head of “Customer Service” Sue Lewicki, and likely beyond. Before, during and after the sale. And not limited to just the Grafton/Northshore location, either. Company-wide, they’re Doing It Wrong. 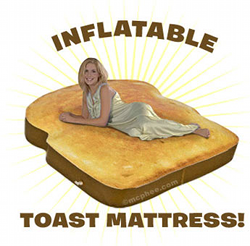 Really, about the only thing we think they do right is provide a relatively large selection of merchandise (which does not, to our knowledge, include the Inflatable Toast Mattress, pictured above…). Nearly everything Colder’s sells you can find–and buy–elsewhere in the Milwaukee area or even online, easily enough. David: Thanks for writing; we appreciate you taking the time. We’ve mentioned multiple times that deals may exist if the ‘perfect storm’ of circumstances presents itself, and you’re willing to take your chances with terrible post-sale customer service should something go wrong. It sounds like you’ve had positive experiences with Colder’s thus far, and we’re happy about that for you. Based on our own experiences, and feedback we’ve read and received from other Colder’s shoppers in the area, though, we hope you never have problems with any of your purchases. You’re correct: sixty years is indeed a long time for any company to be in business. Companies don’t stay in business for sixty years by doing nothing right. We don’t think Colder’s sales practices of late are what brought them sixty years of business success, however. Terrible customer service–before, during and after the sale–and the flippant, arrogant, even combative attitudes of store and corporate management to customer issues and consumer complaints… are not what keep businesses standing in good stead for decades. So we agree, Colder’s probably didn’t get this far for this long by ripping people off over the last sixty years. But we believe they’re either directly or effectively doing exactly that now. And if they continue, they certainly won’t–and shouldn’t–last another sixty. As for the million-dollar salesperson at Colder’s Grafton, that is impressive. If he did so himself, good for him; it’s even more impressive that it allegedly happened in what normally seems to be a pretty dead store. Maybe that’s a whole-store sales total, though–who really knows? We’d like to believe it’s true… but we’ve been told a lot of things by salespeople there that were just part of the pitch, that we later found weren’t true at all. If salespeople are engaging in the kinds of practices that we’ve experienced, of course, it wouldn’t be terribly difficult to bank a lot of money for the store and the company. Particularly, again, when store and corporate management ignore customers who have been ripped off by being told one thing one time and another thing entirely the next. And again, we’re not the only ones with ongoing, unresolved problems. Colder’s apparently refuses to fix even the most minor customer issues to anyone’s satisfaction but their own. And it’s not just one salesperson or manager. It’s multiple people at all levels, from the sales floor to store management to Colder’s corporate offices. As for the empty Grafton store parking lot, it was interesting to see someone else point this out before us. We drive past the Grafton Colder’s on I-43 multiple times a day most days. It’s usually pretty empty regardless of the day/time. And unless people are shopping in the store for hours and hours on end, day after day, some employees appear to be parking out in front of the store. Trying to make the store look busier than it is? Who knows. The same cars there in the morning or midday are still there in the evenings. Do other Colder’s stores do this, too? Based on our own observations, the Grafton store, relatively speaking, is not a very busy store. Given the location, the dearth of similar competition nearby, and the draw of all the other shopping in the immediate area, one would reasonably expect–in our view–a bit more consumer traffic than they seem to get. Hello Alex, I get everything your saying, and I am sure that there is at least one person out there that cannot stand one store because they have been wronged. Bottom line is this. You and a few others who have decided to post on this forum have had bad dealings with Colder’s. Let me kindly say that again: You and a few others who have decided to post on this forum have had bad dealings with Colder’s. Pesonally, I would never step foot into American TV. They hae wronged me more than once. But I would not go out of my way to create a web forum about why one should not go to American TV (There are already plenty of forums about that) This is the only forum I can find on why not to go to Colder’s. I have referred many friends and famiy to Colder’s Grafton and they have ALL had a great purchasing expirence. I understand your frustration with the company, but you and I both know that it seems to be your personal vendetta to try and bring down the Colder’s name via this forum. I respect your right to do that, I just think that if thats your purpose (which it clearly seems to be) It’s just not going to happen. Colder’s has built up a client base that spans over 60 years. Colder’s reputation in Milwaukee was firmly planted years ago, before I was born. I called Colder’s and asked them just how long there pricing structure has been in place. They said they first introduced it in February of 2008. If the pricing system was not working, I think they would have stopped it. As you noted Alex, a business does not stay in business for over 60 years if promotions do not work. I think they would have dropped it if it stopped working. Just my 2 cents. I purchased a washer and dryer set recently at Colders. Being on my fourth set in as many weeks, I speciffically asked the sales person about vibration. He assured me the set I was purchasing were the best, he owned them himself. I also speciffically asked about the return policy if I encounter problems with vibration, Fred, the sales person, assured me I could bring the set right back, for a full refund, no problems, no questions asked. Now the story is; we don’t take back merchandise, at all. When I brought the set back to Colders to return, a greasy little sales manager informed me that the washer and dryer were my property, and instructed me to remove them from the store’s parking lot. And that’s where they are today. I will be canceling the charge with my credit card and see how that works. In this day of increasing customer service, I cannot believe a retailer coould possibly treat customers as poorly as I have been treated, I will recommend to every one I know to stay away from Colders. My story is too long to tell, however, I would never suggest to anyone to ever buy anything from colders. I received the same treatment the person above stated. I was so disgusted with the little crooked manager I had to deal with. He suggested that I got what I paid for, that it wasnt the “top” of the line furniture. But it shouldnt matter. My furniture had some scratches and dings in it. He would not take it back. I had a “repair man “come to my house and try to fix it. He told me that my shelves on my book cases were warped! and that they would replace them. I believe this repair man was shocked to see the cheap book cases that he had to try to fix. He did order me new ones. I’m sorry…new ones…dont I just get new book shelvesand cases? Because if the shelves are warped then the wood on the book cases are warped? RIGHT? I’m sick to my stomach on this on! NEVER AGAIN! @mcf: “That’s the way we do it” is something we’ve heard a lot, too. Colder’s could really do the right thing here and work with their customers and their community, but by all appearances (of which we’re aware), they do not–at all. And when the fix is so inexpensive, it’s just a sad shame. Thanks for sharing, and good luck; we hope you’ll keep us informed about any changes to your situation with them. ….. Just like others have said… we wished, we’d have done our research on Colder’s before ever going there. We met twice with the salesman & was very clear about our needs. Our first mistake was “trusting him”! Second mistake… we didn’t get everything in writting! Bottom line * * * after getting the BBB involved, Sue Lewicki/Colder’s (after many days of headaches & a lot of stress) agreed to take the item back! However……….. we would have to take almost a $300.00 loss because their highly reccommended item (from their salesman) failed “BEFORE” it was 1 month old! Since when do furniture companies get away with selling defective product & have the luxury of charging their customers ‘restocking fees’ for a return? “GET IT IN WRITTING” is our message & “DON’T TRUST ANYONE”. We never will! @deeme: Ouch. The treatment from Sue Lewicki is not at all surprising. Someday someone will write a book about the absolute-worst customer service to ever exist (let alone in a small, local-market company), and it will feature a photo of her. Or Cthulu. Or both, maybe to see if anyone can distinguish between the two. Her attitude and behavior is flippant, arrogant, and just plain evil. I just don’t understand how anyone could treat another person the way she’s treated people (ourselves included), in business or otherwise. I think we should all get together at a colder and in the middle of there show room drop off all of are crap and let all of there new customers see what they have to deal with. It’s not practical; not many people would want to haul stuff around like that. Colder’s would just resell it all and make more profit. We certainly appreciate your thinking, though! Yikes, I’m glad I stumbled onto this thread! My DH and I just bought a new house and need to buy alot of furniture. He told me – hey I hear Colder’s is having a 50% off sale this weekend, we should go. I already don’t trust furniture salespeople but for sure after reading all of this there is no way I’m going there to buy furniture! If you really dig around on the site here, there are a few comments from people saying they had good luck with Colder’s and were satisfied. I guess it comes down to what kind of risk taker you are. And as you mention, trusting in furniture salespeople in general is not at all easy. Good luck. Wow! This has been really informative. Thanks a lot to everyone whose attributed a comment. Special thanks to you, Alex. I am currently in need of a sectional and was highly considering Colder’s. Especially with their “Dollar for Dollar” sales event. However, a big red flag arose when I went to the website and there were No Prices for any of the items! Furniture at least; didn’t even check the others. Even after clicking and continuing to click, I did not see a single sales price. So I looked around and happy I came across this comment board. For whatever it is worth, your testimonies saved at least one person from a horrible ordeal. Much appreciated. Yet does anyone have a good recommendation of where to purchase reasonably priced furniture? Thank you. @JD: Thanks for writing. I haven’t purchased any furniture lately, so I’m not sure what to recommend these days locally. All I know is where I won’t ever shop again. Wish I could be more help!